Mella Jaarsma’s wearable sculpture The Carrier addresses the fleeting nature of all living things, especially the temporality of humans and their urgent need to escape their current situation or move from place to place. She notes how the human condition of gathering experiences without knowing why, collecting possessions, and fearing death while longing for immortality impacts every living human being. We live in a world in which people are on the move as travelers, vacationers, explorers, and even migrants fleeing the oppressors of their beloved homelands. Today, in capitalist-driven environments, merchants and their consuming masses can be considered carriers of cultures on the move from country border to country border, some of them on the run from oppressors and dictators begging the question: What do I take and what do I leave behind? Dutch-Indonesian artist Mella Jaarsma creates drawings and handmade garments that explore social tradition and its uncertain future. 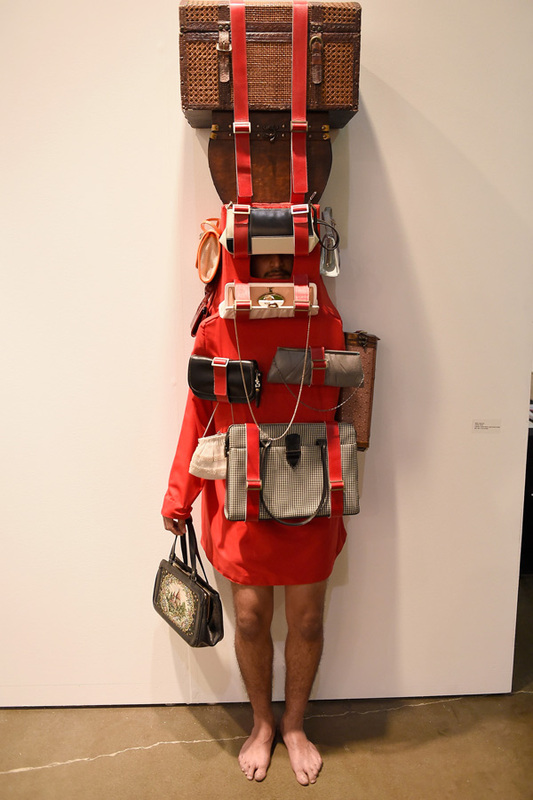 Her work addresses some of the central questions that arise when cultural identity is assigned to objects or when authority is assumed over others by creating division between one thing and another through ethnic or folk stylization. Jaarsma’s constructions of occupational and ruling class regalia—the tourist, refugee, or soldier—operate in a way that facilitate the study of power by positing new associations which challenge time-honored ones. She sews together material elements that speak to the vulnerability and defenselessness in human existence as a burden and possible illusion. She questions the male/female/human psyche through costumes that express the complexities and fleeting insecurities core to being mortal while living in a screwed up society. Her wearable sculptures testify to the hidden subjugations found in culture, especially those located inside Jaarsma’s own contemporary Indonesian life, by pinpointing their codes and associations.